They breathe through their branchiae and can retreat into their tapered shell, which closes with an operculum. They relish the tiny algae which encrust the decor; if they are well fed, they proliferate quickly. They are considered less effective than the planorbis, but as they bury themselves, they contribute to the equilibrium of the aquarium by turning over and aerating the bed. If you want to get rid of them, introduce a fish from the Tetradon genus, which will appreciate these mollusks. 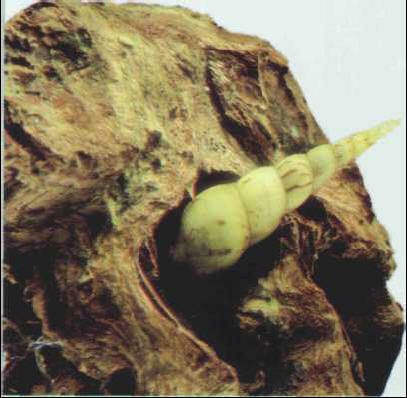 Several Malayan snail species belonging to the Melanoides genus (such as Melanoides tuberculata), native to South-East Asia, can be unintentionally introduced into tanks along with plants. Size: 1-2 cm.